I have been testing the new iOS12 public beta out since its release and am loving some of the new features. One introduction was screen time, this enables you to see how much time you are spending on your phone, what apps you are using and how long you are spending on them! This is great, well kind of, it shows me how often I disappear into an instagram hole due to your stories! There are a load of new features that you can read about here! The public release for the non beta version will be available on 17th September! But one feature that I really I am looking forward to, but the teen probably not so much is the Screen Time feature mentioned above! WHY!!??? I hear you cry, well because this can also be used as a new parental control. Screen Time feature will let you limit / control the amount of time your children are spending on their phone and even see which specific apps they are using and much quiet a bit more! Now the first thing to point out is you need to make sure that you have Family Sharing setup on your phone, if you don't know what this is then read this! You need Family Sharing set up to enable you to see your Children devices. 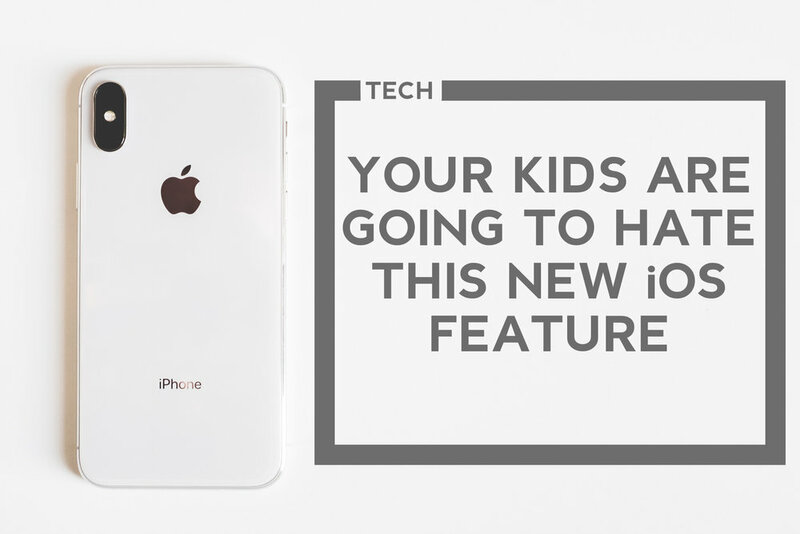 if they are not then you won't be able to see them, view their screen time or set control options! OK, first thing first is to turn Screen time on! to do this is pretty simple! Prees "Turn On Screen Time"
Then asked "Is This iPhone for Yourself or Your Child?" .... Select the appropriate response and move on. That is Screen Time setup. Assuming you are doing this for a child you will then be prompted to setup a passcode. Downtime restricts the functions on the phone, allowing parents to schedule a block of time to limit when the Childs device cannot be used. When this is enabled notifications from apps won’t be displayed and a badge will be displayed on the apps to show use isn’t allowed! You can however select certain apps that will always be available. 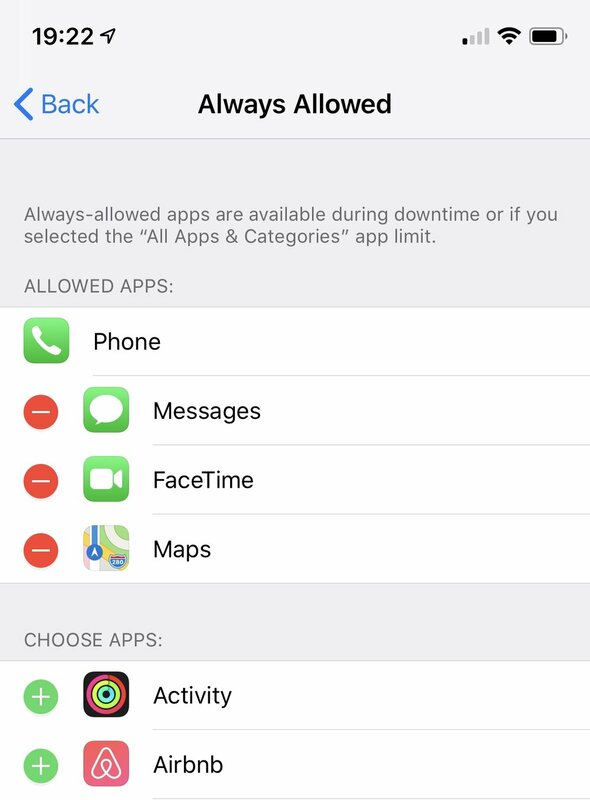 App controls is just as it sounds, this function will let you limit the time your kids can spend on certain apps, you can be very specific, the iOS already bundles the apps into groups such as Social Networking, Games, Entertainment but within this you can then edit the apps it is limiting. This is a very important function to consider, what apps do you want your kids to always have access to regardless of the settings that you are putting in place. From a safety aspect I think Messages should be on there, Maps will be useful as is Find Friends, but here you will see just how much you can tailor the system to work for you! The image only gives you a snap shot but you can scroll through all the apps on the phone. Finally I will highlight content restrictions, this isn’t necessarily new to iOS12 but it is now part of the screen time menu. For me this is a very important setting that you need to get right for your child as this is where you can control what age rated content they will have access to, if they have the function to downloads apps, or make in app purchases (Yes you can stop those accidental purchases!). The screens below give you an idea regarding the controls you have and the restrictions you can make. I am a big believe that technology can really help our children but as long as the right discussions around appropriate use and having the necessary controls in place, hopefully you will have found the above helpful! Of course if there is any help you need feel free to give me a shout or comment below and I will help you where I can.